The essence of what we do is to play the favorite songs of our target listeners over and over. The challenge is to do that in such a way that our listeners will not get the feeling that we’re playing a much smaller song library than we actually are. If we’re playing Today’s Hot Hits, a small group of songs, maybe nine to thirteen, are repeated every three to five hours. If the Listener hears the same two or three Hot Hits two days in a row on the morning commute, well is the station playing only three of Today’s Hot Hits? Power Oldies might rotate three or four times a week, but if the songs “cluster” with some of them scheduling most frequently in one daypart and some other songs scheduling most frequently in other dayparts then, over time, regular listeners may come to feel the station has a library that lacks variety; maybe the impression is the station plays half as many titles as it actually does. Whenever you move songs into and out of your Categories, it is wise to check the Average Turnover / Rotation Prediction charts to be sure your changes don’t result in a play pattern that doesn’t meet your approval. A ‘perfect’ rotation can be thrown off balance with minor changes in the number of songs within the Category. 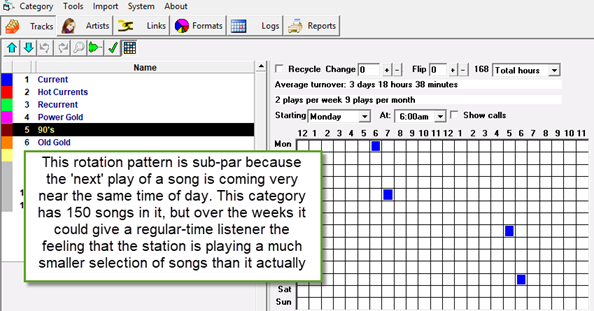 Use the Change box on the Turnover chart to see “what if?”; how would the rotation pattern of the category change if you added or removed a number of songs from the category.